First day of PTC8 (Alex Higgins International Trophy) is underway in Killarney, Ireland. It is nice to see another event held in Ireland after PTC Finals in March early this year. 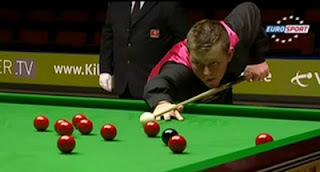 Mark Allen was in top form today - He only dropped a frame in the three matches he won today. He beaten Paul Davision, Mike Dunn and David Gilbert to make into the last 16. The Pistol has never won a ranking title in his career, his best ranking finishes are reaching semi-finals of World Championship and UK Championship. He will be come back on Sunday for his first ranking title. Xiao Guodong surprisingly defeated Ronnie O'Sullivan 4-1 in the second round but unfortunately lost to Northern Irishman Gerard Greene. Green won two consecutive deciders before beating Xiao Guodong in last 32. Nevertheless, the 22-year-old young Chinese stands out and has a bright future for his career. Besides The Rocket, The Welsh Potting Machine Mark Williams was sent home in the first round, losing to James Wattana 2-4. John Higgins, Neil Robertson, Martin Gould and Ryan Day will return on Sunday for last 16. PTC3 winner Ben Woollaston safely landed in last 16 after coming back to beat Liang Wenbo from 0-2 down and decider over Liam Highfield.